Elderly people… You’ve gotta love them. Sometimes they are so innocent that it might just make you laugh. Imagine mixing elderly people with social media. Well, this slideshow has got you covered. 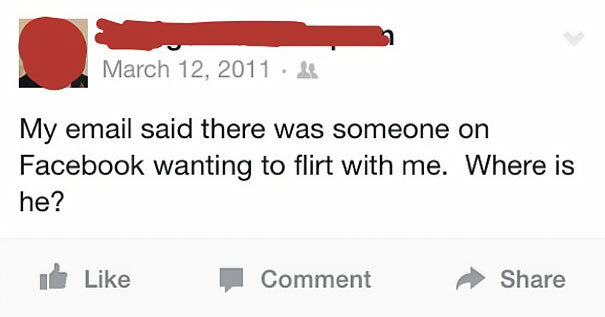 Here are 27 pictures of old people on social media that will change your day for the better. Enjoy! Dwayne is the best. He already has it figured out. He has probably learned patience the hard way during those 26 years. Grandma has a point. 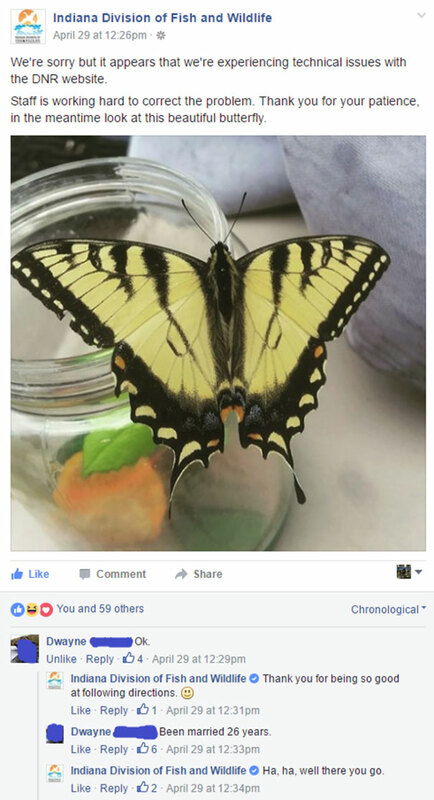 Her comment is too innocent to not love. 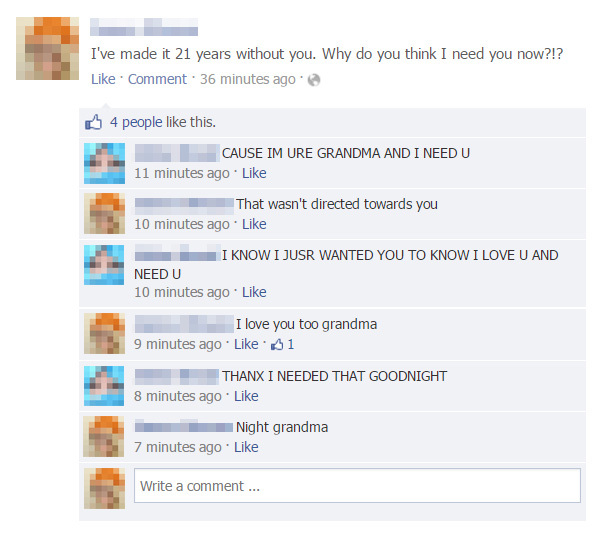 Everyone needs a grandmother like her. I have no comment either, Maxine. It’s funny how she doesn’t have any info to share, but most people put their whole lives on social media. 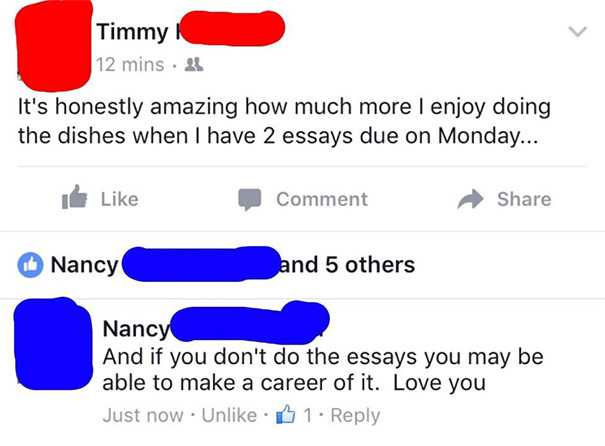 Wow… People getting roasted by their own grandmother. 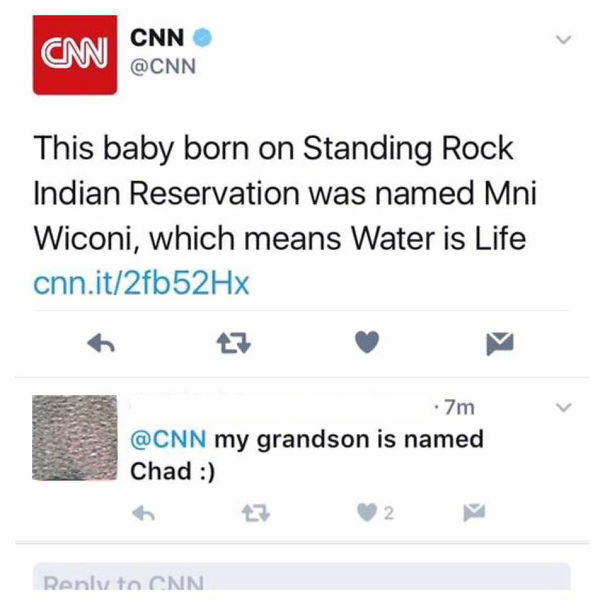 This is what makes social media so great. This is proof that food babies are real. All jokes aside, this it too pure for social media. 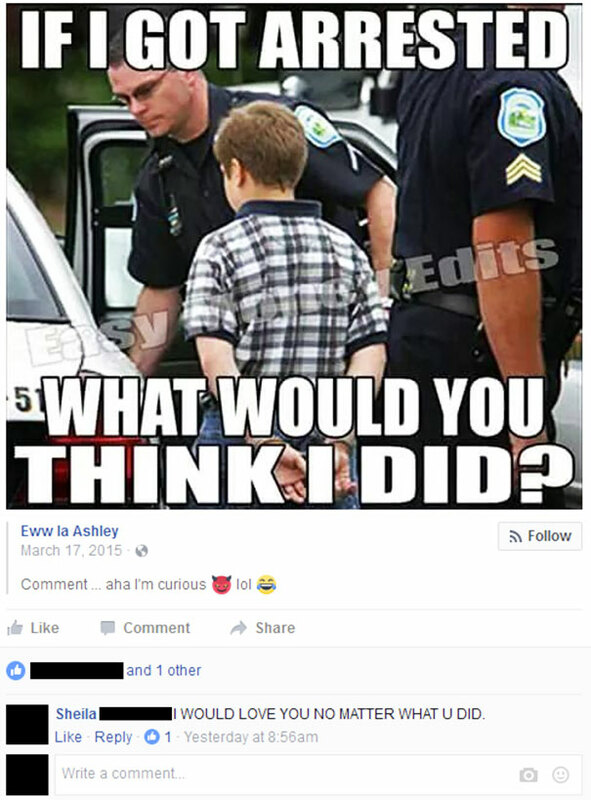 ALL CAPS FROM THIS GRANDMA. That is grandmother goals. The grandchild’s reaction makes it even better. Pretty much the equivalent of thinking lol means “lots of love.” At least she has her daughter to show her the ropes of an iPhone. You can tell this grandchild is unconditionally loved. Positive comments from old people are so wholesome. Grandpa tells it like it is, honestly. He sounds grumpy but also seems like he has a sense of humor at the same time. 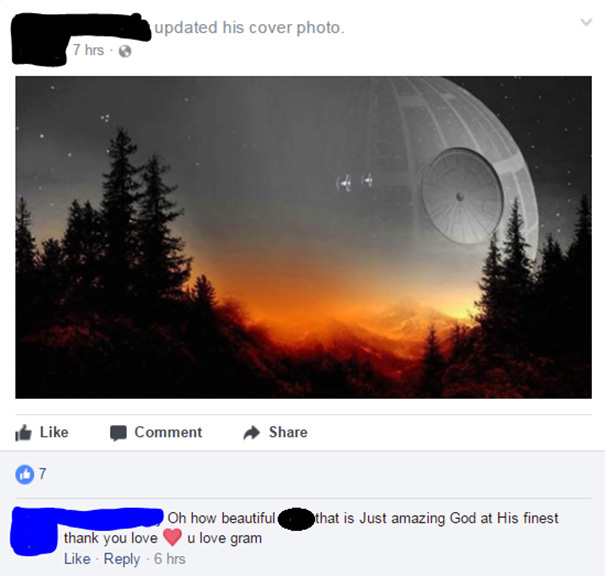 Just a proud grandma that wants to share her love for her grandson. It would be impossible to get mad at her. Practice makes perfect. 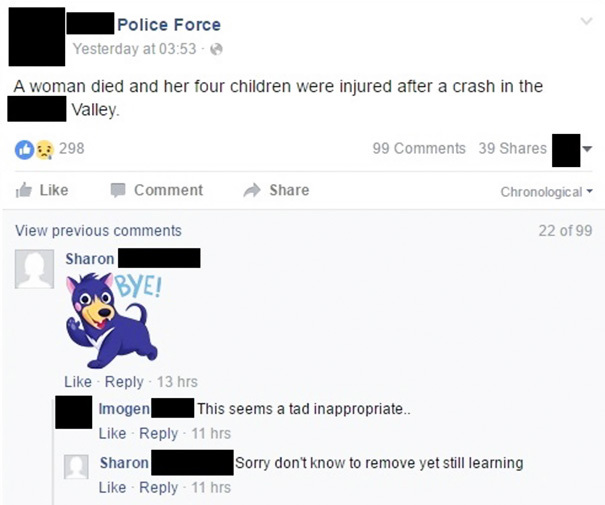 Sharon will get it soon enough I’m sure. She’s one pure lady. There is nothing more funny than elderly people being brutally honest… Seriously. It doesn’t get better than this. So this is what happens when a 86 year old gets a facebook. Looks like she’s single and ready to mingle. Gram still has it. 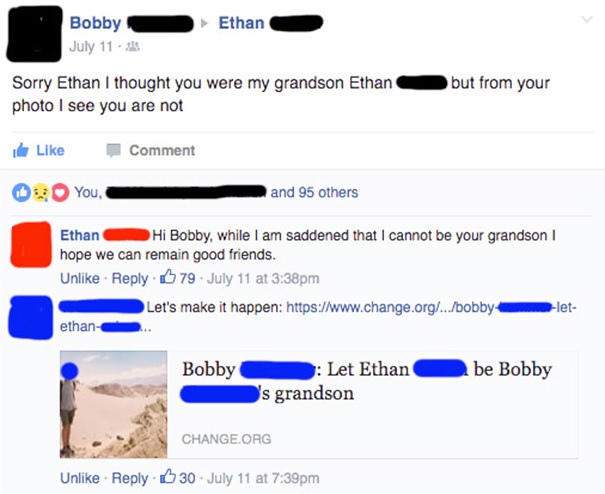 If Bobby offers to adopt him as her grandson, he should take that up. Props to the guy who made that link. I guess when you reach the age 80 you lose your filter. Or that’s what the case is with this lady. 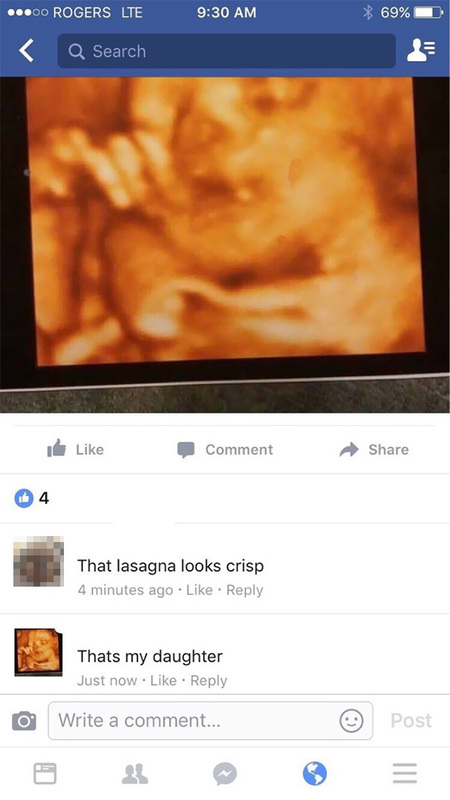 I wonder if she knew it was a public post. 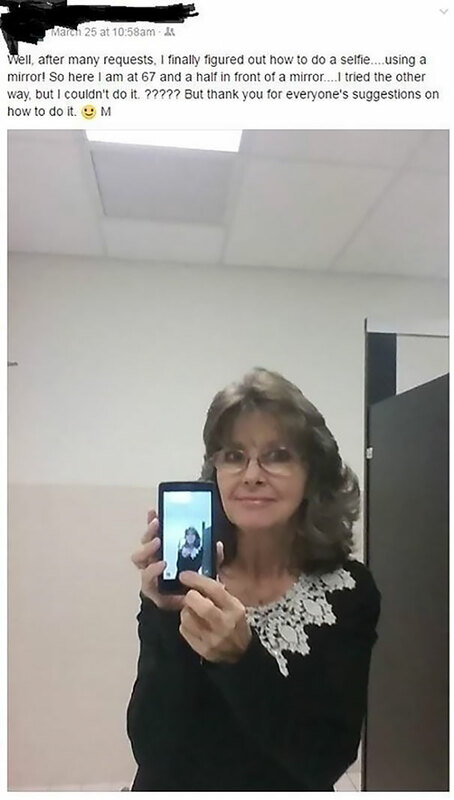 For being elderly on social media, she is doing pretty good. She ages well and did good for a first time selfie. No complaints. 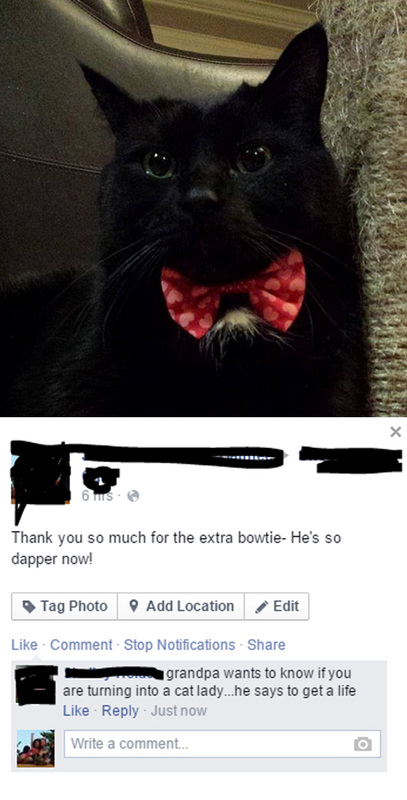 Not exactly how I would imagine people celebrating national pet day. 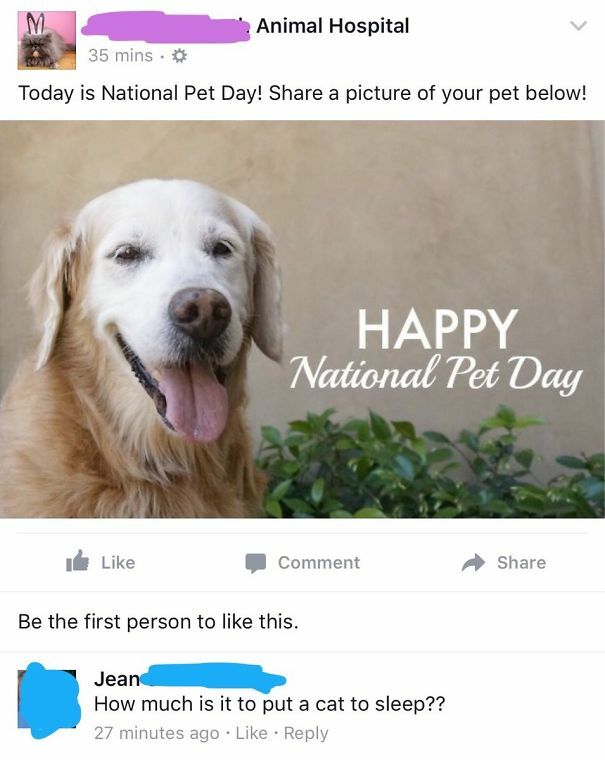 Maybe Jean just isn’t a big cat fan? Poor guy. 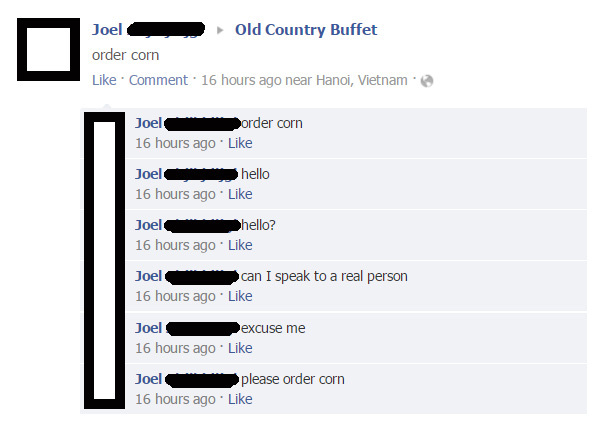 He just needs some guidance on how to order corn. It would not be that complicated if someone just taught him. Probably one of the best tinder pictures I’ve ever seen. 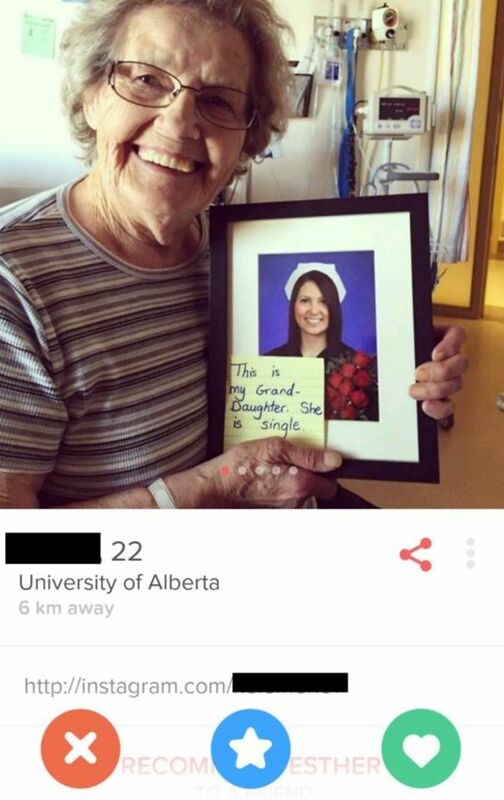 Her granddaughter is single everybody. Hopefully not for long. 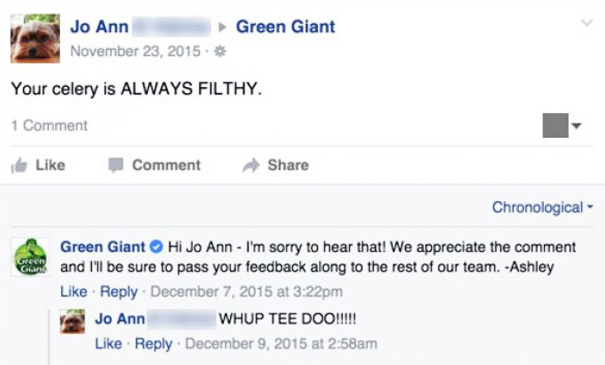 So is angry a good enough word to describe how Jo Ann feels? I can honestly say angry is not a powerful enough word for that. 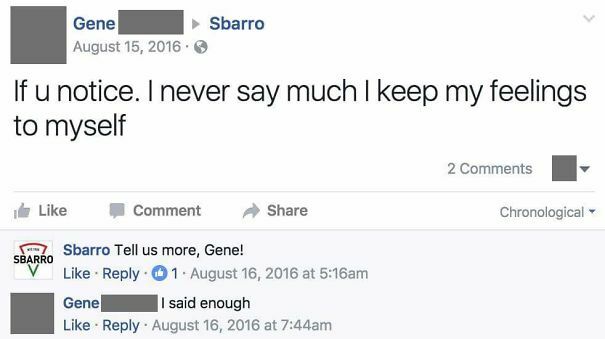 Gene is giving too many mixed signals. Being upfront is key to keeping people from being confused. Maybe he just hasn’t learned that yet. Customer service at its finest. If only all jobs were that simple. 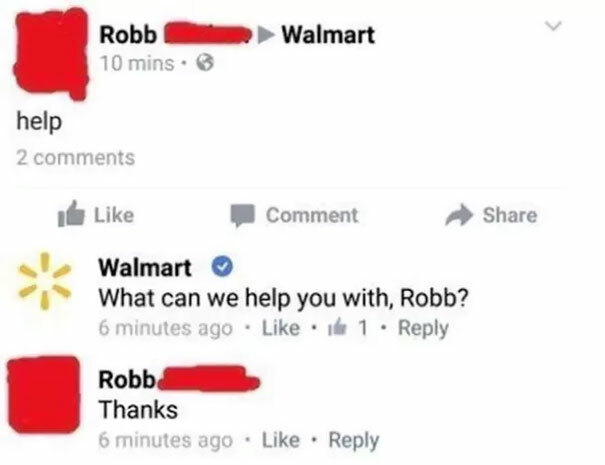 Robb is the definition of an easy customer. I want a family member like her. It’s evident that she has a lot of love in her heart to give. Urgent matter. Ellen doesn’t want people sitting around. She wants it done now.